OnePlus recently released an Android 8.0 Oreo-based open betas for the OnePlus 3 and OnePlus 3T which brings a bunch of new features and improvements to the user interface. The update is coming with some new improvements to the interface and there is a new feature called the call pick up gesture which we previously saw on the OnePlus 5 and 5T recent update. 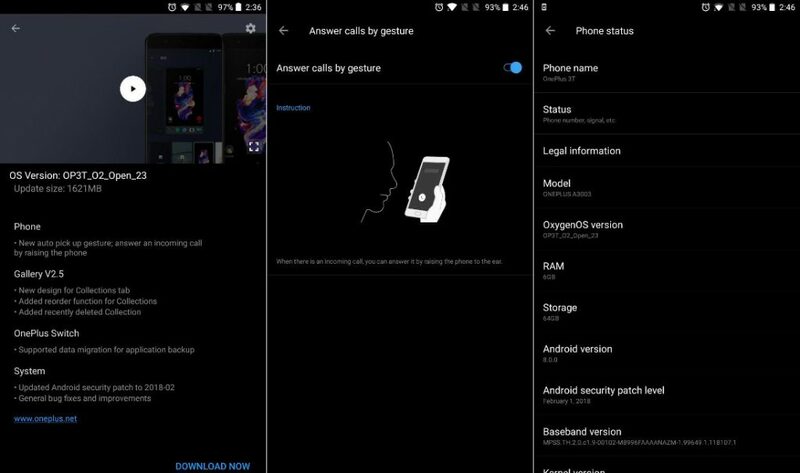 OnePlus has added more features which are hidden from the interface and are core features. The changelog for the new update has been released and there are lots of new features, let’s check them out. The phone app has got a new update where you can answer the incoming calls just by raising it to your ear. The gallery app has been updated to a new version 2.5 with a new design for the collections tab and the functions for collections has been reordered. A collection has been deleted recently. OnePlus Switch app has been upgraded to a new version where the application data can be switched between the devices seamlessly. The system has been upgraded to a new security patch of February 2018. Some bug fixes and improvements have been added to the new update. The update is about 1.6GB in size and the latest security update has been added to this new update. The Android version is still not upgraded to the Android 8.1 yet with this update. This is a beta update so you need to flash the open beta build, then you will get this update on your OnePlus 3 or 3T.